I. Mixed-Integer Model Formulation. Lecture 1: Disjunctive Representations. Lecture 2: Further Illustrations. Lecture 3: Constructions which Parallel Set Operations. Lecture 4: Topics in Representability. II. 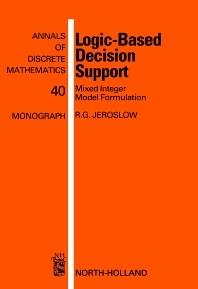 Logic-Based Approaches to Decision Support. Lecture 5: Propositional Logic and Mixed Integer Programming. Lecture 6: A Primer on Predicate Logic. Lecture 7: Computational Complexity above NP: A Retrospective Overview. Lecture 8: Theorem-Proving Techniques which Utilize Discrete Programming. Lecture 9: Spatial Embeddings for Linear and Logic Structures. Lecture 10: Tasks Ahead. Illustrative Examples. Solutions to Examples. Bibliography. This monograph is based on a series of lectures given by the author at the first Advanced Research Institute on Discrete Applied Mathematics, held at Rutgers University. It emphasizes connections between the representational aspects of mixed integer programming and applied logic, as well as discussing logic-based approaches to decision support which help to create more `intelligent' systems. Dividing naturally into two parts, the first four chapters are an overview of mixed-integer programming representability techniques. This is followed by five chapters on applied logic, expert systems, logic and databases, and complexity theory. It concludes with a summary of open research issues and an attempt to extrapolate trends in this rapidly developing area.